ReliAscent is happy to announce the release our second newsletter of 2017! In this issue, we feature an article on Fringe Benefits, Deltek® Pulling Support for its GCS Premier® Software, and more. 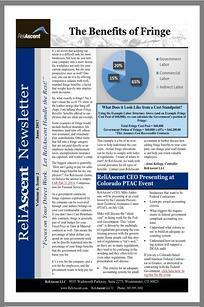 To download your copy of ReliAscent's latest newsletter, click here now! As always: if you ever have any questions about FAR & DCAA compliance, our services, or government contracting in general, please do not hesitate to call or email us at any time (and if you haven't joined our newsletter distribution list yet, fill out the form on the left to sign up).